I have a lot of crazy ideas. I also have wonderfully supportive people in my life who are really good at saying, “That sounds like a great idea. Go for it!” Putting these two things together can be a dangerous (but awesome) thing. It is no secret that I love to read. I also love the extras that authors have been putting in the back of many cozy mystery books these days. Recipes, decorating tips, etc. This got me thinking about other fun ways to enhance the reading experience beyond the pages of the book. Thus, A Cozy Experience was born. It is a project my sister Lisa and I have been working on together, which has made it extra fun. The idea? Each month you receive a box with a cozy mystery and items inspired by the book delivered to your door. Then you interact with fellow readers on Facebook through the month and experience the book together. We are kicking off with our first box in October. We have been hard at work designing the website and creating the first box. Our site is almost ready to launch and should be up later this week! Yay! For now, we are on Facebook and Twitter. It has been humbling and exciting to read the kind comments from many who are on board with this idea. So go on over and join the conversation! This is why the blog has been a little quiet the past couple of week. We have been hard at work behind the scenes on this project. 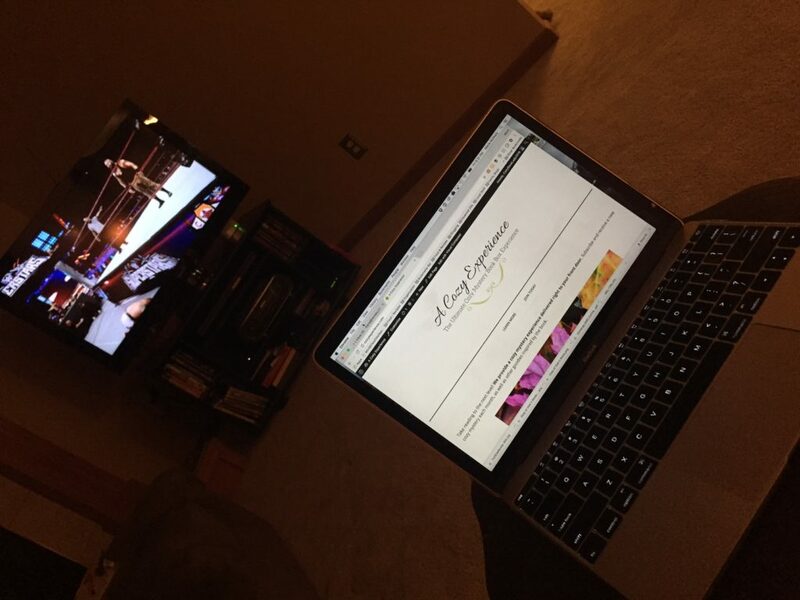 Pictured above is a little real life look at some late night blog editing while I catch up on my guilty pleasure of pro wrestling. But don’t worry. More posts and book reviews are on the way in the coming weeks. And one thought before I go. Those crazy ideas you have in the shower? The ones you are afraid to say out loud because they might be embarrassing or not work out? Try them. They may work out. They may not. But they will cause you to learn things about yourself and grow as a person in the process. And that itself is worth the risk.